What do turtles eat, anyway? 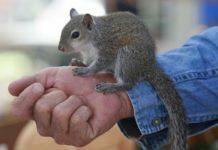 If you’re thinking of getting one as a pet, this is something you should know! Read on to find out. Turtles. Tortoises. Terrapins. These are just three names to describe the more than 200 known living species of “Testudines” (translation: turtles). Testudines can trace their lineage all the way back to the Triassic period. The Triassic period occurred 247 million years ago! Not all types of turtles make good pets, whether due to dietary needs, extremely specialized habitat requirements or sheer size. For instance, the leatherback sea turtle can weigh up to 2,000 pounds and measure six feet long. That makes for one big pet! If you are caring for a pet turtle (or terrapin or tortoise) for the first time, you have just embarked upon both an exciting journey and a steep learning curve! Habitat design, turtle diet, lighting, access to water and land surface, veterinary care, seasonal brumation (hibernation)….all of these topics comprise a “required reading” list for turtle owners! In this article, we are going to focus specifically on what do turtles eat. Feeding turtles a proper turtle diet is SO important! Just as we are what we eat, so too can your choice of turtle food support or impair the health of your new pet. What do you feed turtles? Let’s find out together! The first topic to tackle here is the type of turtle you are caring for. This is vital because what to feed turtles absolutely depends on what species of turtle you are feeding! First, let’s take a brief look at the different classifications for turtles. Some turtles have flippers. These are generally called sea turtles. Examples of sea turtles include the leatherback, the green turtle, the Kemp’s Ridley sea turtle. Sea turtles do not make suitable pet turtles. Some turtles like to spend most of their time in fresh or brackish (fresh + salty) water. These turtles are called – interchangeably in many areas – turtles or terrapins. Examples of terrapin species include the wildly popular red-eared slider, the painted turtle, the common snapping turtle, the alligator snapping turtle, the diamondback terrapin. Here, it is worth mentioning that the super-popular box turtle is actually a member of the pond turtle/terrapin order, although it is sometimes confused for a land tortoise. This is understandable, as the box turtle is fond of water but spends most of its time on land. Last but most certainly not least, the turtles that lumber on land, looking like nothing so much as petite shelled elephants – well, these are the tortoises. Examples of tortoises include the gopher tortoise, the Sulcata (African spur-thigh) tortoise, the red-footed tortoise, the giant Galapagos Island tortoises, the Hermann’s tortoise, the Russian tortoise, the leopard tortoise, the Horsfield’s tortoise, and so many more. Some tortoises make excellent pets while others can be more challenging to care for in size or habitat requirements. There are some differences between wild turtles and the turtles we buy as pets. You should know that owning some kinds of turtles, including sea turtles and Eastern box turtles in some areas, is illegal because they are endangered species. Additionally, other turtles, such as the alligator snapping turtle, may not be well-suited to be pets even if it is legal. In some states, you might need a permit to own one. So check the rules regarding species of turtles, if you’re looking for one that is not normally considered as a pet. Some species that are considered good pets include the painted turtle, the red eared slider, the map turtle, and the wood turtle. Releasing pet turtles into the wild is problematic because many domestically raised turtles carry salmonella and other bacteria to wild turtles. So make sure you know your care requirements and can handle one before you buy! Hopefully by now you have placed your pet turtle in its proper category. Now we can move on to talk about turtle eating habits and requirements. The answer to all three of these excellent questions is “yes,” depending on the species of turtle you are caring for! Some turtles eat just plant matter. Some turtles have evolved to eat primarily meat protein. And some turtles, like all people, have become opportunistic feeders, aka omnivores. The only way to know for sure what do turtles eat is to research what your specific type of turtle needs for a healthy diet. This way, you can develop a menu that represent the best turtle food for your turtle! When most people think of wild turtles, they think of sea turtles. So what do wild turtles eat? As it turns out, the sea turtle diet can be quite diverse! And while these turtles are not kept as pets, learning about sea turtle food can be so interesting! For an example of two quite different sea turtle diets, let’s take a look at the green sea turtle diet and the leatherback sea turtle diet. Green sea turtles are the gentle herbivores of the ocean. This species of sea turtle is the only one adapted to eat only plant matter! The green sea turtle has a really neat bill (mouth) adaptation. It is serrated, to bite off and swallow algae and sea grasses. If you can imagine the fine serrated teeth of a hand saw, you have a good visual picture of what a green sea turtle’s jaw looks like. Leatherback sea turtles, in contrast, have evolved to eat only animal protein. They are the true carnivorous sea turtles! They eat soft-body sea animals such as jellyfish, sea squirts (tunicates), sponges, and squid. The leatherback turtle’s jaw has fine-edged cusps, or points, at the top and bottom front of its bill (mouth). These cusps make short work of biting down on their prey, which then gets sent “down the hatch” with the help of the spines (papillae) which line their inner mouths and throat. If you can picture those backwards-facing spikes at the exit of many rental car lots, you know exactly how a leatherback’s spines work! What do baby sea turtles eat? Baby sea turtles eat a different diet entirely than adult sea turtles! This even includes green sea turtle babies, who are as keen for the taste of meat protein as any baby sea turtle. For sea turtles, baby turtle food includes jellyfish, fish eggs, seaweed, molluscs (snails, squid, clams), crustaceans (crabs, crayfish, shrimp) and hydrozoans (hydra, Portuguese man o’ war, fire corals). Now let’s take a look at what do water turtles eat and what do land turtles eat! Painted turtles take their name from their brightly colored markings. These beautiful water turtles often sport vivid red and yellow markings on their shell, head, legs and tail. They are quite common, although less well-recognized than the red eared slider turtle, which can display similar coloration. One really interesting thing about painted turtle aquatic turtle food is that this turtle has adapted so it can only eat in the water! Like all turtles, the painted turtle doesn’t have any teeth, but it also has an extra challenge because its tongue also doesn’t move about freely in its mouth. So in order for the painted turtle to grasp and swallow its dinner, it must get help from water to wash it all down. What do small turtles eat? As babies, painted turtles strongly favor a meat protein diet, but adult painted turtles are omnivores. Sometimes it can seem like red eared slider turtles were born hungry. These turtles are the epitome of “opportunistic feeders” in the sense that they rarely meet a meal they don’t like! Like painted turtles, red eared slider turtles need to eat in the water. For this reason, red eared slider turtle food should always be served in the water. When checking out what do pet turtles eat at your local pet store or online, you will notice a great many commercial turtle foods that are pelleted. These pellets tend to float well on the water and make it much easier for your pet turtle to eat! However, as you can imagine, it isn’t as much fun for your red eared slider to chase a pellet as it is to chase a small feeder fish such as a minnow or a guppy! Most pet stores sell these feeder fish that you can introduce into your turtle tank at meal times. 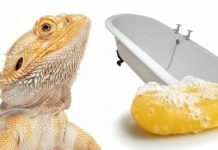 You can also offer wax worms, tadpoles, earthworms, crickets, snails, slugs and even small frogs as your turtle grows bigger. What do baby turtles eat? Well, like painted turtle babies, red eared slider babies tend to eat a lot more meat protein than adult slider turtles. Baby red eared sliders may even eat a 100 percent protein diet when available. Overall, around 70 percent protein is good. Adult red eared slider turtles should take about 50 percent of their diet from meat protein and about 50 percent from plants and vegetables. Most pet stores stock live safe water plants you can install into your turtle tank. You can also chop up dark leafy greens, clover, carrot tops, endive, green beans and similar floating greenery to feed. If there is a true never-met-a-meal-they-didn’t-like turtle on this planet, it is likely the snapping turtle. But first we should probably back up to say there are two surviving snapping turtles species: the common snapping turtle and the alligator snapping turtle. Both turtles are keen omnivores, but both favor meat protein whenever they can get it. Like other water turtles, snappers need to eat their food in the water. The common snapping turtle has a smoother appearance in adulthood, while the alligator snapping turtle takes its name from its rugged, ridged shell that sometimes makes it look like a muddy dinosaur! Baby snapping turtles are jaw-droppingly cute! As babies, their powerhouse jaws are much less risky to come in contact with than when they reach maturity and can weigh anywhere from 40 pounds (common snapper) to upwards of 300 pounds (alligator snapper). These long-lived turtles can live up to 150 years in the wild and around 50 years in captivity. But if you do decide to keep a common or alligator snapping turtle, you will likely start out with a young hatchling or juvenile. So what do baby snapping turtles eat? You can find a wide assortment of fresh protein at local pet stores, fishing stores or even in your backyard. Minnows, earthworms, shrimp, guppies, tadpoles, insects, snails, plus prepared protein-rich pellets can make for a good dietary base. These can be fed to baby and adult snapper turtles alike. As your turtle grows up, you can also add chopped cooked fish, beef, chicken, turkey, crayfish and similar meat protein for variety. Plant matter is also much appreciated, especially by adult snappers. Water plants, chopped dark leafy greens, and some fruits for treats (strawberry, banana, apple) will also be snapped up! 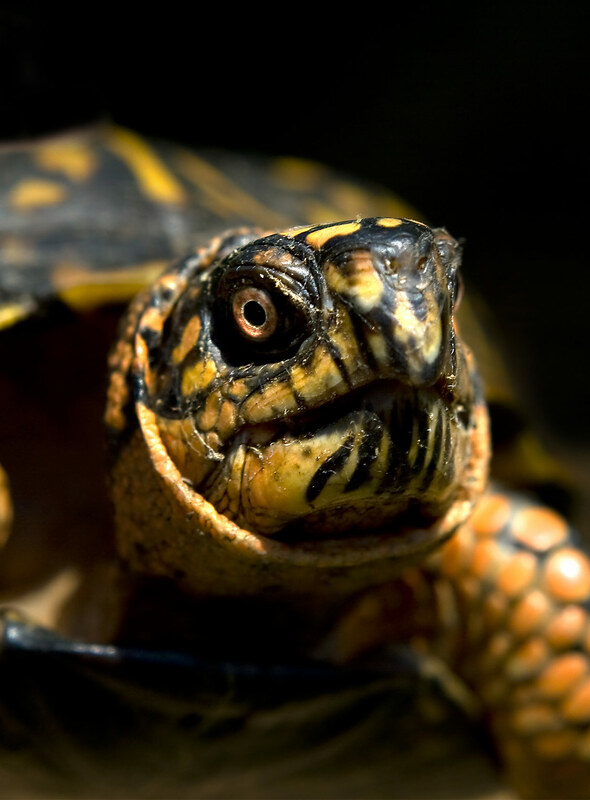 Box turtles are one of the most popular pet turtle species. These turtles take their name from their unique shell – box turtles are the only turtles on the planet with special dual hinges that allow them to fold into their shell, then close and “lock” their shell tight from the inside! Once securely inside their shell, the lock is so strong you can’t open it without risking harm to the occupant. Box turtles in the wild tend to be very shy, but if you raise a box turtle from a hatchling, they often become quite outgoing, especially when begging for treats! Box turtle food should represent this turtle’s evolution as an omnivore – so both meat protein and plant matter are needed and valued. Pet box turtles are very intelligent and expressive and can quickly pick up on how to behave to get their carers to offer more food. So care must be taken not to overfeed! If your box turtle starts to look like her shell is a tight fit, this is a sign you may be overfeeding. Similarly, if your box turtle’s shell begins to look a bit roomy, you may not be feeding him enough. Your vet can help you determine your box turtle’s optimal weight and food portion sizes and frequency. What to feed a box turtle will be different depending on your box turtle’s age. Hatchling and juvenile box turtles will need a bit more meat, but this will change as your turtle grows up and become more omnivorous. Young box turtles should receive 70 percent protein and 30 percent green matter. In adulthood, aim for a 50/50 blend of meat and plant matter. All turtles can become picky eaters if fed a too-limited diet, and this is also the case with the box turtle. For adult box turtles, aim for 50 percent protein, 30 percent vegetables, 10 percent leafy greens and 10 percent fruits. Protein sources can include cooked whole meats (no salt or processing), insects, boiled egg, soaked dog kibble, gut-loaded worms and similar selections. Veggies can include green beans, mushrooms, carrots, sweet potatoes, squash, okra and cactus pad. Leafy greens can include collard greens, carrot tops, dandelion greens, mustard greens, romaine lettuce, turnip greens, kale, parsley and similar others. Fruits can include berries, mango, papaya, apple, strawberry, figs, banana and similar others. Box turtles can be particularly fond of fruits, so be sure to monitor portion sizes. Also, don’t leave fresh food out all day as it will rot or may attract pests. Let your box turtle eat freely for 60 minutes or so, and then remove whatever food remains uneaten. What do pet tortoises eat? Learning what tortoise eat is no different than learning what pet turtles eat – it really is a matter of species. Some land turtles (tortoises) have evolved to eat purely plant matter, while others are omnivores. The key to figuring out what do turtles eat is to learn as much as you can about your tortoise’s environment in the wild! For instance, forest tortoises have evolved to eat the local vegetation found in that area. So, too, desert tortoises have evolved to rely heavily on dry climate succulent plants (such as cacti) for their nutrition. Tortoises tend to love fruits, but these should represent just a small percentage of the diet – around 10 percent. Fruits are very high in sugar and can lead to weight issues. Let’s take a look at the different dietary needs of two tortoise species to get a sense of the wide variety in tortoise diets. 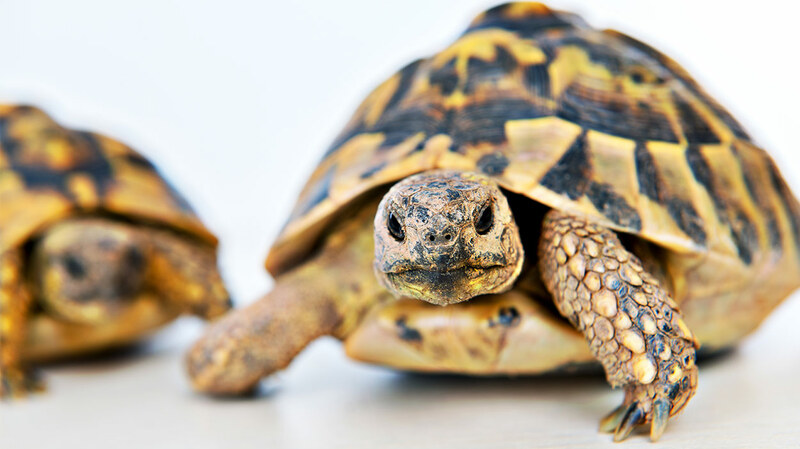 You will want to follow up with your veterinarian to tailor your tortoise’s diet to the needs of that individual species. The African spurred tortoise is a desert tortoise. These tortoises are herbivorous (although if they happen to ingest the occasional insect as they are foraging, no one has ever heard them complain). Grass, cactus pads, cactus fruit, dark leafy greens, flowers, colorful foods like yams, carrots or sweet potato are always a hit. These tortoises are kind of like lawnmowers, and will often graze for the majority of the daylight hours. The red foot tortoise is a tropical forest-dwelling tortoise. As such, they need high humidity levels in captivity (unlike the African spurred tortoise, which evolved in the arid desert). Red footed tortoises are typically described as enthusiastic eaters – they love to eat! 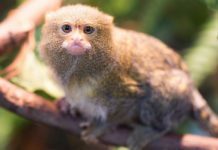 In the wild and in captivity they are omnivores and need both meat protein and plant matter (fruits and vegetables) to thrive. Why won’t my turtle eat? If you encounter a situation where you are anxiously thinking “why wont my turtle eat?” here are some things to check. When in doubt, ALWAYS bring your turtle in to your exotic veterinarian for a check-up! Make sure the turtle is warm enough – these are cold-blooded animals who won’t eat readily when they are too chilled. Try to vary the timing of meals to see if a.m. or p.m. is better. Space out the meals more – maybe your turtle is just still full! Can your turtle easily grasp and swallow the food? Is your turtle kept in a group and being bullied? Watch the dynamics to check. Have your vet check for illness! How often do you feed a turtle? The frequency of feedings can depend on several factors: whether your turtle is an enthusiastic eater or more finicky, the age of your pet turtle (hatchling, juvenile, adult, senior), the weight of the turtle (underweight, overweight, just right) and your exotic veterinarian’s guidance. For general purposes, baby turtles need to be fed at least daily, and sometimes more than once per day for water turtles to avoid food disintegrating before they can get to it. Adult turtles can be fed less frequently. Some people continue to feed their adult turtles daily, while others adopt a 6 days on/1 day off regimen, and still others space out 2-3 feedings over the week. In the wild, your turtle would have the ability to eat whenever food presented itself. However, your turtle would also have to work a lot harder to find food! So learning how often do you feed a turtle can be a bit of a challenge initially – talking to breeders of your turtle species can really help here! What can turtles eat from human food? Since there are so many different pet turtle species, there is no one-diet-fits-all answer to this question. Your exotic veterinarian and your own research can help you determine the best diet in the best ratio for your unique pet turtle species. Turtles, like people, need a little help to make the Vitamin D so necessary for strong bones and shell. Calcium for turtles plays a part in helping turtles make and absorb Vitamin D, as does proper exposure to ultraviolet-B light. We hope you have found this in-depth look at what do turtles eat helpful to guide your efforts to care for your pet turtle! Learning what can turtles eat ensures your turtle, terrapin or tortoise will have the best quality of life and the longest life with you! Langley, L. (2017). How to Tell a Turtle from a Tortoise. National Geographic. Pierlioni, A. (2016). How Popular Pet Turtles Became Popular. The Turtle Room. Axelson, R. (2009). Feeding Aquatic Turtles. VCA Animal Hospital. Bosch, A.T. (2003). Common Snapping Turtle. University of Michigan. Buhlmann, K. (2018). Information About Snapping Turtles. Reptiles Magazine. Cook, T (2010). Box turtle diet. Box Turtle Site..
Smith, B. (2018). What Do Tortoises Eat? Sciencing. Schaup, R. et al (2018). African Spurred Tortoise Care Sheet. Chadwell Animal Hospital. Heinen, J. (2014). Redfoot Tortoise Diet. The Redfoot Tortoise Breeder. Scott, J. et al (2004). Health and Husbandry. Gulf Coast Turtle and Tortoise Care Society. Highfield, A. (2003). Promoting Proper Bone Development. Tortoise Trust.